Her kit’s as white as snow. Her mini-England strip’s on show. She’ll grow up supporting the Lion. He’s already enrolled her as England No.8. He might be hoping for a boy! I am forever thankful that only one of ours is in any way sporty – if all 7 had wanted driven around different events we'd have gone mad! Ah, well…when she's off with Daddy watching for real, you will have those afternoons to yourself! Bless her! Daddy must be so proud. My daughter is more of a football fan and has been known to rock a Man Utd shirt. 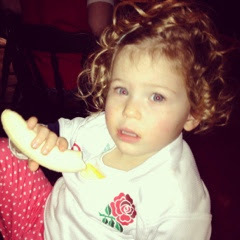 She takes her brother's rugby very seriously though and always tells her friends about it and refers to the team as 'we'. lol – sweet! I have a pic of my daughter (then aged 18 months) running off with our mini rugger ball much to the boys disgust!